Video clip synopsis – Natalia Goncharova and Alexandra Exter were both Russian artists but where one moved to Paris and incorporated folk art traditions into her work, the other was drawn back to Bolshevik Russia and embraced the revolutionary art of constructivism. Broadband MP4 hidden4_bb.mp4 (17.4MB), suitable for iPods and computer downloads. Natalia Goncharova & Alexandra Exter is an episode of the series Hidden Treasures (15 × 5 mins) produced in 2006. Students should be able to interpret different aspects of an artwork’s meaning and messages and compare artworks through the application of interpretive frameworks. The Ballet Russe attracted artists to Paris from all over Europe but particularly from Russia. The impresario, Serge Diaghilev, had been barred from employment in any service to the Russian Crown after falling out with the Imperial Theatre in St Petersburg. Instead, he dedicated his talents to promoting the arts of Russia outside Russia and introducing the Russian avant-garde to Paris. Among the first he lured there was Natalia Goncharova. The costumes she designed for his ballet Le Coq D’Or—now in the National Gallery of Australia’s collection—were exactly what he wanted. The saturated colours and bold designs became the trademark of his performances. While other European modernists were looking to alternative traditions for their inspiration, to what they referred to as the 'primitive’ art of Africa and Oceania, Goncharova drew on her own. She looked to early Russian religious icons and folk art. Around the time that Goncharova left Russia, Alexandra Exter was returning, keen to participate in the Bolshevik experiment of 1917. She too loved theatre design, believing it to be the most democratic and inclusive of the arts. However, her costumes were inspired by the abstract geometry of revolutionary Russian constructivism. Among her work preserved in the National Gallery is her costume design for a Martian guard in the 1924 science-fiction film Aelita–The Queen of Mars, and two marionettes that were to take the place of actors in another silent film, where they were intended to epitomise the commercialism of streetlife in New York. Although Exter died in poverty and obscurity in 1949, she still had the two marionettes with her, preserved as fond memories of her first flush of enthusiasm for the new order—a symbol of the optimism of those early days of the Russian Revolution. Around 1910, Russian intellectuals began to theorise about the place and purpose of machinery in modern life. The art movement of Soviet constructivism derived from these theories, and from other styles in art such as cubism and futurism. Constructivism eventually became concerned with the view that art had a social purpose, that there should be no pure aesthetic beauty in art at all, but only simple forms and shapes that served an intellectual purpose. Select appropriate artworks from this period and discuss how they express these notions. Select works by Alexandra Exter and Vladimir Tatlin and explain how they demonstrate the constructivist style. Compare the influences that impacted on the artworks of Natalia Goncharova and Alexandra Exter. Discuss the major differences in their artworks. 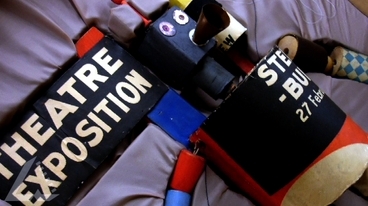 Using materials such as cardboard, tin and wood plies, create a sculpture in the constructivist style. Give important consideration to the space between the forms. Discuss how constructivist artworks utilise the elements and principles of design in non-objective composition, then create your own composition. Begin by cutting chipboard or lino into small squares and rectangles. These shapes are inked and placed on a sheet of rough paper in the style of the constructivist artists, using normal printing process. When dry, use coloured pencils, crayons, and oil pastels to complete the composition. Shapes may be outlined or linked together with line.